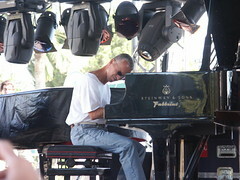 The pianist Keith Jarrett recently played a solo show at Carnegie Hall. People coughed and took photographs; Jarrett stopped the show in objection and walked off. Jon Pareles wrote about it, but he's certainly not the only one to document this phenomenon in recent years. In cases like these, I find myself thinking: Gah, stop doing that! Don't have a crippling pet peeve for expectorating and mechanical clicks if you're going to be a public performer. Don't chastise your paying audience for generally accepted conditions of being a performing artist in any genre. Human life is, often involuntarily, loud. Is your music really dependent on an absolutely silent house of several thousand, in contrast to virtually every other musician in human history? It is weird, of course, to be telling an artist what to do. I don't particularly think it's in my place to seriously do so. It's also obvious that Jarrett couldn't care less about what I think. And he also has a point: If you're concentrating on listening nearly as hard as he's concentrating on playing, you'd be conscious of your emissions and his requests that you control them. A huge part of the magic of live music is unpredictability. That is irreplaceable, especially in jazz, where the spontaneous creation of something new is paramount. It also opens the door to fits of pique; one phenomenon allows for another. But as far as I can tell, enough people want the magical part that they're willing to sit through a tantrum or an awkward vibe. It's also wholly reasonable that you wouldn't enjoy Jarrett's music enough to deal with the other stuff, not to mention the considerable price tag. So if you're going to be too put off by Jarrett's antics to enjoy his art, especially considering the money you've put down, don't go. Cost-benefit analysis. Enough people seem to be consistently voting for #1 rather than #2 such that concert halls like Carnegie are still willing to put on Keith Jarrett concerts. By this point, the hissy fits seem like a well-documented phenomenon; if they were an insurmountable hassle, audiences (and by extension, venues) would be voting by withholding their dollars. Demand for Keith Jarrett concerts still seems high for how much attention "cough-gate" has received. So what if you're on the fence? Say, what if you're debating plunking down $75 (or however much it costs) to see Keith Jarrett, who you love, but aren't comfortable with the possibility of him stomping off in a huff? My advice is to go for it, mostly because most of us don't see enough live music, and "you only live once," and even if you don't feel like you got your money's worth, it'll at least be a thought-provoking adventure. However, I might also recommend you look at the opportunity cost and the substitutes. If you live in a big enough city or are attending a big enough festival with the financial resources to host Keith Jarrett, there's probably a lot of other unique improvised music going on, not to mention other entertainment options. With that money and those two hours, you could be getting about as much or more satisfaction seeing something else for significantly less expense. You wouldn't get the specific brand of satisfaction Keith Jarrett can give you, though. And regardless of how much or how little monetary value the market demands for it, that factor is why any of us care about all this. I generally like Keith Jarrett's music. This discussion isn't really about his music, though. No, I wasn't at the concert on Sunday. Anecdotal evidence from those who were suggests that the coughing was in fact quite loud for a massive room and an unamplified piano. It strikes me that neither Jarrett nor the audience have any clearly-defined "rights" here. Jarrett has a contractual obligation to perform; he has every "right" to execute that performance as he will. The audience, for its money, has every "right" to behave as it desires within the venue's policy. The reason some folks react to Jarrett's stage mannerisms ("antics," as I previously described them, was a poor word choice) negatively is thus a matter of palatability, not legal or moral right. Nobody is obligating Jarrett to be a nice guy. Nobody is obligating audiences to pay attention. Performances generally go off without a significant hitch because audiences and performers respect each other enough to honor requests and commonly-accepted standards of behavior. Performers generally behave with surplus gratefulness for their audiences, and learn to tolerate less-than-ideal conditions; audiences usually pay close attention and honor artists' requests to be reasonably quiet. It seems like when these debacles happen, neither side is trying hard enough to meet each other. Jarrett's generosity of spirit and tolerance for crowd noise seem unusually low, to an outside observer; so do his audiences' abilities to stifle a cough or not take photos or what-have-you. Sean Gough points out this was five minutes within a three-hour concert. That's important to keep in mind. But five minutes can sour a mood for three hours too. Finally, the issue of artists like Jarrett grunting should have no bearing on this issue whatsoever.